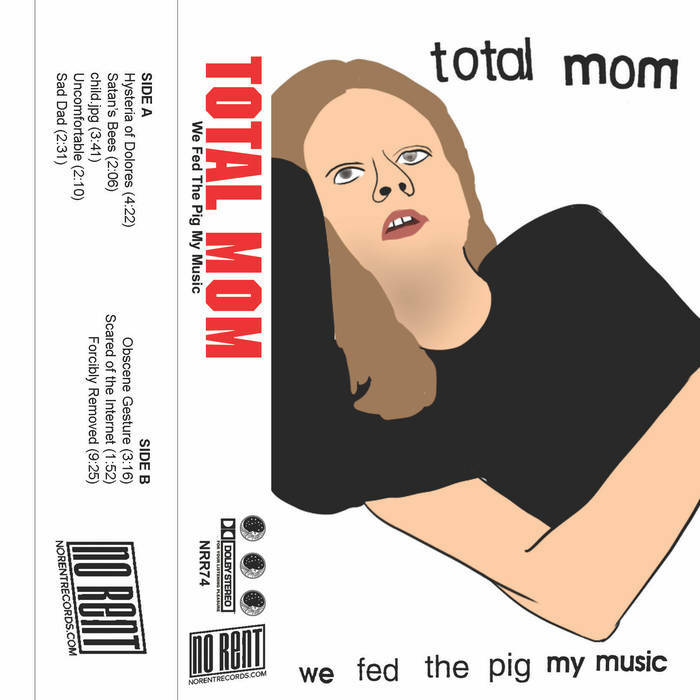 TOTAL MOM - "We Fed the Pig my Music"
Honestly, I had to get hold of this. Any tape that features a track called Satan's Bees is bound to be something I am going to be interested in. We Fed the Pig My Music is noise - raw, seething noise. At times, it is a bubbling vat of violent noise eruptions. At other times, it's a solid wall of audio evil that flattens you like a sonic steamroller. I'm not sure exactly how these sounds were created - but if I had to venture a guess, I would say the technique involves ripping a hole in the space time continuum, and running tape as the contents of the galaxy are sucked into another dimension. You may ask yourself, "If that is so, then how are we all still here?" I'm sure there is some sort of reasonable explanation. For now, I'll go with - everything arrived in the new dimension just as it was, but with slight changes. There is probably some movie we grew up with that does not exist anymore. However it all went down, it made a hell of a sound - and is presented here in Dolby stereo for your enjoyment. This catastrophic pile of unwavering, mind-penetrating head melt comes from Providence-based noise freak, Total Mom, and is just the kind of necessary mess I've come to expect from No Rent Records. Newer Post[Album of the Month] QUICKSAILS - "The Bright"
Older PostWIZARDS TELL LIES - "Bad Nature"